Sabrina London is back! The fate of the Elemental Kingdoms rests in the hands of its newest ruler: Sabrina London. When last seen, the fairy princess had made a deal with the King of Filth to save the lives of her friends. Now she is fighting to live the life she wants while trying to save the lives of millions. A monster, more dangerous than any other she has overcome threatens both the human and non-human world. How will she restore the balance? Despite the risks, Sabrina enlists the aid of one of her people’s biggest rivals. She has spun a complex web of lies and deception, now trying to gain her freedom, unaware that everyone she allies with has their own plans. 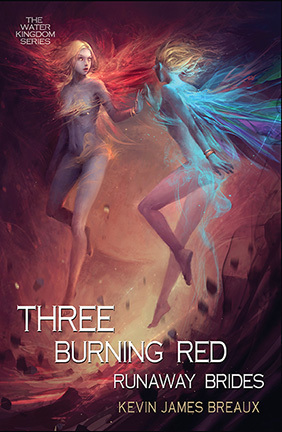 THREE BURNING RED RUNAWAY BRIDES is the action-packed third and final book in The Water Kingdom Series, following TWO POLLUTED BLACK-HEART ROMANCES and ONE SMOKING HOT FAIRY TAIL. Breaux is always enthusiastic about the challenge writing presents. He lives by the motto "Write Makes Might! "© and sees each new page as an opportunity to improve and advance. Awesome cover! I am absolutely going to read this book.